University of New York in Prague (UNYP), in cooperation with State University of New York/ Empire State College, is a unique university in Czech republic. Part of the added value in the education to be gained at UNYP at all levels is in the philosophy of encouraging the transfer of theoretical concepts to real-life situations in professional and work environments. A highly diverse and internationally focused higher education institution, University of New York in Prague is an ideal destination for study in the heart of Europe, offering modern, progressive programs in cooperation with prominent partner institutions, and a truly international staff, faculty, and student body. At UNYP, you can study in the successful Bachelor's, Master's, MBA and Ph.D programs of our foreign partner universities offered in cooperation with State University of New York/Empire State College, La Salle University, University of Bolton and Greenwich University, or a local Bachelor program in the field of Business Administration accredited by the Ministry of Education, Youth and Sports of the Czech Republic (Bc.). The University cooperates closely with a number of multinational companies and offers an exclusive opportunity to apply their new knowledge in practice. As part of their studies, students can apply for study stays abroad, or get professional placements and internships which can lead to permanent employment. UNYP is the largest and leading English language Higher Education Institute in the Czech Republic. Teaching takes place in English and the programs are open to foreign students. Currently, more than 800 students from more than 60 countries study at UNYP. Lecturers come from the United States, EU and the Czech Republic (more than 30 countries in all), and bring with them both academic and professional backgrounds. 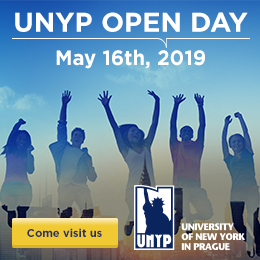 This makes UNYP the most diverse and multicultural institution in Czech Republic. UNYP offers a true international enviroment for every single student. MŠMT - UNYP is officially recognized by the Czech Ministry of Education, Youth and Sports as a private higher education institution. BAC - UNYP is accredited and recognized by the British Accreditation Council for Independent Further and Higher Education as an institution providing higher education, since 2001. CAMBAS - UNYP is a accredited and recognized by CAMBAS, the Czech Association of MBA Schools, since 2003. ACCA - The Association of Chartered Certified Accountants examinations are the most frequently recognized qualifications in Europe. UNYP offers higher education programs approved by the U.S. Department of Veterans Affairs where United States veterans and their eligible dependents may use their veterans benefits. IACBE - UNYP's European Bachelor’s in Business Administration (BBA) and Master’s in Business Administration (MBA) degrees are accredited by The International Assembly for Collegiate Business Education (IACBE). The 4 year American Bachelor programs at UNYP lead to an American Bachelors Diploma awarded by SUNY/ESC, as part of the co-operation between the two Institutions. SUNY/ESC is an American University accredited by the Middle States Commission on Higher Education, the main academic accreditation body for American colleges and universities located in the Middle States region. CEEMAN - Central and East European Management Development Association, the largest association of business education providers in Central and Eastern Europe. TAKE THE OPPORTUNITY OFFERED BY UNYP, GATHER CONTACTS FOR YOUR FUTURE CAREER AND JOIN AN ELITE GROUP OF STUDENTS.